02-Feb-2007 -- After 122 visits, I finally met a confluence from which I was happy to leave. It wasn't because the spot wasn't beautiful: It was because of the weather. I had been teaching Geographic Information Systems and GPS at the Rosebud Sioux Tribe's Sinte Gleska University in South Dakota all week. I thought that a confluence visit would make a perfect capstone to the week of spatial thinking. I left Valentine, Nebraska, at 4:45am, traveling south on US 83, where I was treated to one of the most magnificent full moons over the wonderful Nebraska sand hills that I have ever seen. The moon was so bright that I could clearly see the hills in all directions: What a sight! South of Stapleton, I turned east on Highway 92 to Arnold, then south on Highway 40, and then east again on the same highway (40). The dawn neared and I nearly missed the turn to the south, at a sign that read "Cozad, via County Road, 30 Miles." This road made the whole trip worthwhile--beginning in the sand hills, dotted here and there with pines, and only a few houses in 20 miles of road. I dropped abruptly onto the Platte River plain, but just before doing so, captured a magnificent scene of the moon setting behind an abandoned farmhouse. I turned west on the first road in the valley, Road 770, and then drove north on Road 420. I realized with dismay that the closest approach to the confluence was at the driveway of the closest house. Not wanting to disturb the occupants at this early hour (6:45 am), I drove north to where the fence ended. Beside a vacant house probably used as an outbuilding from a larger farm, I bid good morning to a few cattle there. I thought I was well bundled against the cold. My first clue about the actual temperature was that my GPS display was curiously white, so much so that my photographs of it at the confluence were not of decent enough quality to warrant posting on this web page. My second clue was that the batteries of my camera did not last long. Surely the temperature was as cold as my previous prairie treks to 41 North 102 West in Nebraska in December 2005 or to 46 North 103 West in North Dakota in February 2004, but for some reason, I felt it more acutely. I was fine for awhile, hiking west along the fenceline. The snow had crusted over, but I sunk in places up to my thighs, and once up to my waist. It was slow going. I couldn't help but think of those penguins sliding on their bellies in Antarctica as I tried to do the same under the barbed wire fence when I reached 100 West. After that, I only sunk about 6" at each step, and steadily made progress, walking due south. After 15 minutes, I passed a center pivot irrigation unit and passed within sight of the farmhouse, and then out of sight again. I reached the confluence at 7:20am local time. The confluence lies on ground sloping about 5 degrees to the south, on a field that had been planted in corn during the previous year. It lies in a small valley about 200 meters wide and widening toward the south. The confluence lies at the north end of the irrigated lands of the Platte River valley, near the boundary with the Sand Hills. I couldn't trust my thermometer, but I would estimate that the temperature was about -5 F (-20 C) under clear dawning skies. I saw no animals and few birds, and no people during my trek. The farthest view is to the southwest across the Platte River valley to the hills on the other side of Cozad. I had been to 41 North several times, in Wyoming, Nebraska, Iowa, Illinois, and Indiana. It is always a extra special thrill to stand on the 100th meridian, and I had done so previously in South Dakota, Kansas, and Texas. Looking at the photograph and movie I filmed at the confluence, one cannot tell that I was experiencing some serious pain. Someday, I need to find some gloves that I can wear while I am filming, because I always have to remove them to do so at present. My fingers and toes froze. Unlike the people who lived here, I wouldn't last one winter. Someone would find my body in the spring while they were planting the fields. I made haste to leave, and as anyone knows who has had extremities numbed with the cold, the worst part is when the digits actually start to thaw. I had to double over twice in pain, and made a beeline to the northeast, to avoid the waist-deep drifts. I took a few photographs of the roadway and cattle before thawing further in the vehicle. For the remainder of the day, my fingers felt very hot. As the hike was probably only one hour in total, I felt like quite the wimp. I was thankful for the opportunity to visit 100 West, but was also thankful that the public land survey system, designed in the late 1700s, made for a short hike. Driving back south past the farmhouse, I spotted a teenager carrying a large poster into the house. The occupants had probably been up this entire time, but oh well, mission accomplished, I continued on my journey south to Cozad, the nearest town. A street in Cozad is named Meridian Avenue, so at least someone in town is aware of the significance here. It is against my credo to take the Interstate highway if I can avoid it. However, because I was uncertain about the snow conditions to the west, and knowing that the Interstates are the best plowed, I hopped on the on-ramp to Interstate 80 and headed west to Colorado. The confluence detour required about 2 hours and 15 minutes and it was indeed the perfect way to end the week of GIS and GPS training. 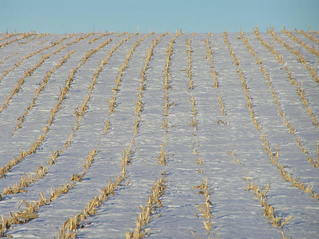 #1: Rows of corn in the snow: View to the west from 41 North 100 West. #2: Joseph Kerski in the snow at 41 North 100 West. #3: Center pivot irrigation: View to the north from 41 North 100 West. #4: Ground cover at 41 North 100 West. #5: Moonset about 3 kilometers northeast of the confluence, just before I visited the site. #6: View to the southwest from the confluence across the Platte Valley. #7: 360-degree movie with sound filmed at the confluence site (MPG format).